The most dangerous gate to leave open during a stormy season is the entry gate to the mind. Every spirit filled believer should have on, at all times, the full armour of God to withstand the devil’s scheme (Ephesians 6:11). The armour of God is not complete without the helmet of salvation and the sword of the spirit, which is the word of God. The mind is where all transactional activities of human thinking and reasoning takes place. It is the bedrock of sound judgments and informed decisions. The brain is the organ that serves as the platform for the function of the mind. It is therefore not surprising that the Bible refers to, “an Helmet” being part of the armour of God. The helmet is a head gear; it protects the brain from danger and damage. Spiritually, the helmet of salvation protects the believers mind from hostile forces and evil attacks. The first of which is the spoken word. Words that condemn, ridicule and destroy self worth of others. The helmet is a mind shield, and it plays a vital role in relational storms. Relationships go through cycles of storms, whether between husbands and wives, parents and children, pastoral ministry teams and so on. It often starts with insightful spoken words, malicious lies, fights, disagreements, arguments, sense of injustice or loss, unforgiveness, hatred, envy and bitterness. It is at these times that the helmet of salvation is most effective for every believer. 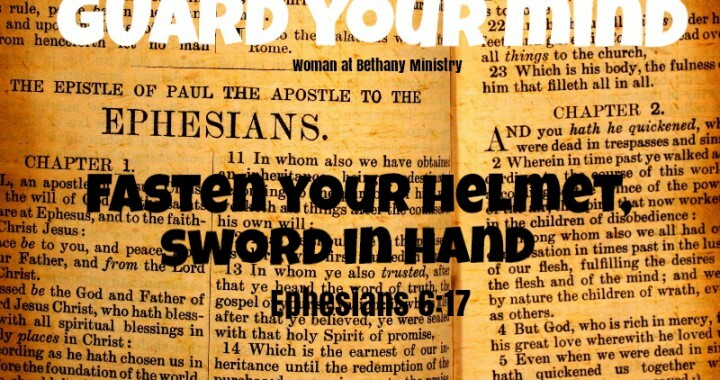 The helmet of salvation and the sword of the spirit work hand in hand. The helmet of salvation releases antidotes of comfort, strength, calmness and boldness into the mind of a believer through the word of God. Praying and meditating on God’s word during times of trouble stops us from losing our minds, it keeps depression and hopelessness away. Stop and answer this simple question, “right now, whose voice is the loudest in the circumstance”, the Lord’s voice through His word or the voices of people? Be aware there are wolves in sheep clothing roaming about in your space, looking for opportunities to extend your grief. Let the light of God illuminate the situation so you can see clearly. The Lord will reveal the good, the bad and the ugly. Psalm 19:8 “The precepts of the Lord are right, giving joy to the heart.The commands of the Lord are radiant, giving light to the eyes”. Whatever the Lord wants you to know concerning the situation, he will reveal at the appropriate time. The Lord will keep nothing away from His children. The duty of every believer is to guard our minds by taking care of what we hear, the company we keep and the confessions we make. Be spiritually alert, and allow the Holy Spirit to speak through Gods word into your heart.